I’ve completed (or at least attempted) a whole week of America’s 30 Days 30 Ways emergency preparedness challenge. Some of the tasks have been simple, others have been much trickier! Today’s challenge recognises a point that I made on Day 3, that if you do have a Grab Bag it should be tailored to your specific needs. 1 Pt: Share with us the most unusual item in your kit and why its in your kit. I don’t think there is a realistic use for the most unusual item in my kit; an Escape Hood. 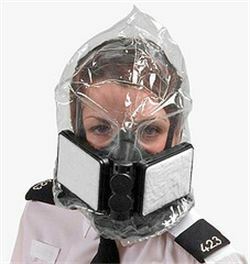 Essentially a bag that you can put on your head in the event of a chemical, biological or radiological incident. It’s not something I would have save for a former employer issuing them to staff. Whilst I can conceive of the situations where this would be useful, I doubt I’d have ready access to my grab bag, making it utterly pointless…I just can’t bring myself to throw it away, you know, just in case! For the second part of the task, I have a standard ‘multi-purpose tool’ but that seems like a cop out! The time difference between me and most of the people playing the game means that most people will submit their contributions overnight, but I’m really interested to see the suggestions of how people have personalised their grab bags.